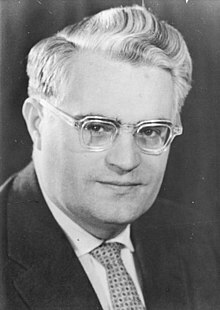 Gerald Götting (9 June 1923 – 19 May 2015) was a German politician and chairman of the East German Christian Democratic Union (CDU) from 1966 until 1989. He served as President of the People's Chamber (Volkskammer) from 1969 to 1976 and deputy chairman of the State Council of East Germany from 1960 to 1989. Götting was born in Nietleben, in the Prussian Province of Saxony, today part of Halle/Saale. During World War II, he served in the Reichsarbeitsdienst, an auxiliary support and supply organization, and later in the Wehrmacht. He was briefly held as a prisoner of war by US forces in 1945. In 1946, Götting joined the East German Christian Democratic Union, a Christian-democratic party. He then spent two years at the Martin Luther University of Halle, where he studied German studies, history and philology. In 1949, Götting became General Secretary of the CDU and, after the establishment in the Soviet Zone of the German Democratic Republic (GDR), was elected as a member of the People's Chamber (Volkskammer), the East German legislative body, in which he served for the next forty years. A loyal supporter of the Communist Socialist Unity Party, Götting helped push out those CDU members not willing to do the SED's bidding in the 1950s. Over the years, Götting came to hold a number of influential positions within the East German state: from 1949 to 1963, he served as the Chairman of the CDU faction in the People's Chamber; from 1958 to 1963 as Deputy Prime Minister of the GDR; and from 1963 to November 1989 Götting served as Deputy Chairman of the Council of State, a position equivalent in rank to the vice-presidency of the GDR. Götting also served as Chairman of the People's Chamber from 1969 to 1976 and as its Vice-Chairman from 1969 to 1989. Finally, Götting was elected Chairman of the CDU at its 1966 party congress. As chairman, he worked closely with the other parties that formed the National Front, the SED-dominated alliance that governed East Germany. During his party leadership, he published brochures exploring the relationship between Christianity and socialism. Götting held a number of other positions in East German society. From 1961 to 1969, Götting was Vice-President of the German-African Society, and from 1963 he was a member of the Albert Schweitzer Committee. He visited with Schweitzer twice, which meetings he recorded and publicized in his book “Begegnungen mit Albert Schweitzer“. In 1976, Götting was elected Chairman of the People's Friendship League of the GDR. On 2 November 1989, just days before the fall of the Berlin Wall, Götting was forced to resign as Chairman of the CDU. Five days later he stepped down from his position as a member of the Council of State, too. In December Götting was arrested, but released in February 1990. On 19 May 2015 Götting died in Berlin, aged 91. Kurt Nowak (1988) Paul Gerhard Braune. Ein Christ der Tat. ISBN 3-922463-57-6. This page is based on the Wikipedia article Gerald Götting; it is used under the Creative Commons Attribution-ShareAlike 3.0 Unported License (CC-BY-SA). You may redistribute it, verbatim or modified, providing that you comply with the terms of the CC-BY-SA.